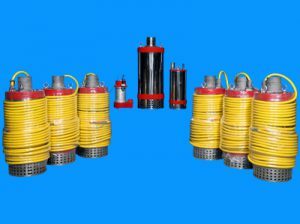 KPR`S Dewatering Submersible Pumps, known for job site dependability. Pumps are constructed of strong die cast aluminum and stainless steel body parts; they are fitted with stainless steel hardened impellers and field adjustable nitrile rubber diffuser. The both upper and lower mechanical seals are wholly enclosed in oil chamber. These tough pumps do not have to be totally submerged and will operate under snore conditions if necessary. All KPR`S pump models are constructed of strong die cast aluminum top cover & bottom cover with sand blasted and epoxy coated for last long. All models use an exclusive dual tandem, double mechanical seal system, with each set mechanically independent, for added protection against water intrusion. Seal faces are tungsten carbide for maximum resistance to corrosion, abrasion & thermal shock. The seals are operated in a stainles steel chamber filled with lubricating oil. All KPR`S pumps are equipped with constructed of strong investment cast stainles steel seal housing for continue seal lubrication and long life. 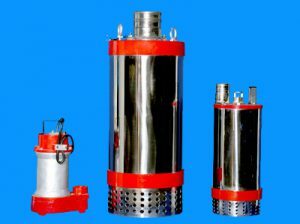 All KPR`S dewatering pumps are equipped with a heavy duty class ‘F’ insulated submersible motor with shrink fitted stator for exceptional heat transfer, keeping the motor cool even under snore or partial submergence conditions. Motor windings are dipped & baked three times in high temperature class ‘H’ insulating varnish for extended protection against burnout & moisture penetration. The entire motor operates in air, reducing motor drag while eliminating the possibility of environmental contaminations.